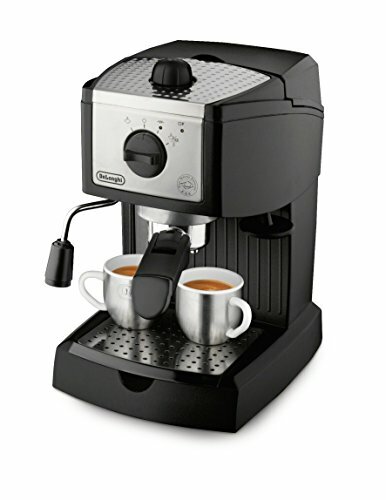 Home » The Best Office Espresso Machines Out There! The Best Office Espresso Machines Out There! Coffee lovers are everywhere. In fact, some people don’t just love coffee, they need it. Whether they need a boost in the morning, a pick me up after lunch, or even those who drink the delicious beverage all day long, some just can’t function without it. The same can be said about espresso. It’s like coffee’s prettier cousin. It tastes great, hits the spot, and overall just gets the job done. What it doesn’t share with coffee, however, is the price. Espresso tends to cost a lot more than coffee. That’s because espresso not only takes longer to make but it uses more ingredients than the average cup of coffee. Because of this, espresso machines can cost thousands of dollars, not exactly an expense the big wigs at the office are willing to shell out precious profit for. That’s why we’re here, to point you in the right direction, and to tell you that espresso machines can be easy on the wallet. Don’t believe us? Continue below to find the best espresso machines for the office. 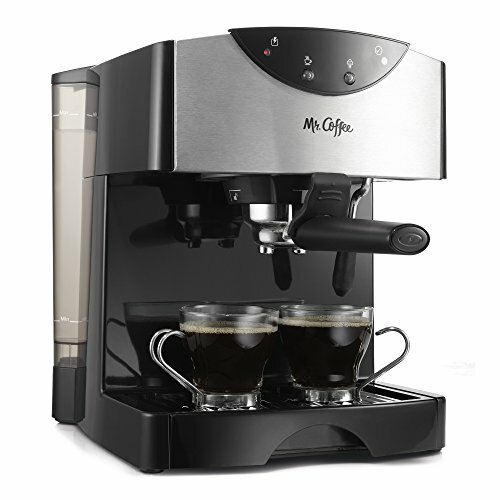 Most people know the brand Mr. Coffee, famous for their affordable and practical coffee makers perfect for almost all households. In business since the early 1970s, they’ve made a name for themselves in the budget-friendly coffee business, but most people might not know they also manufacture devices capable of making fresh Espresso. And yes, they are pretty affordable. The Mr. Coffee Pump, designed for easy, do-it-yourself Espresso, may just be the perfect Espresso maker for the local office. No longer will you or your co-workers be late from waiting in lines at the local coffee shop to get that precious espresso, not to forget cappuccino and lattes. That’s right, this barista-style espresso machines can pretty much brew it all. Factor in the built-in milk frother and it would be hard to think of a coffee beverage this machine can’t produce. 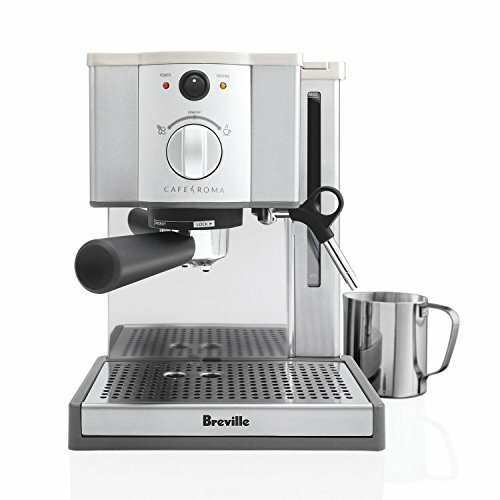 Breville, another popular company among coffee lovers, has also delved into the Espresso market and for good reason. If you love coffee, then you probably love espresso too, or at least cappuccino and lattes. 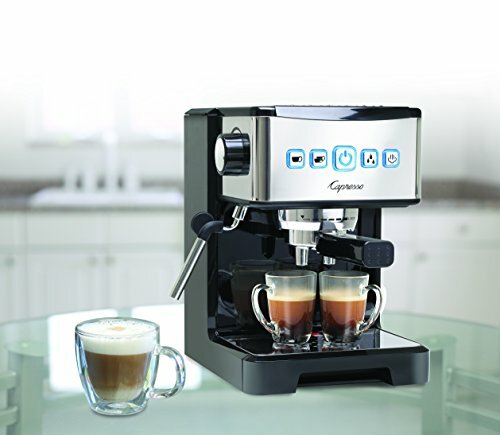 With the Cafe Roma Espresso Machine, you can make whatever your heart desires. Whether its a small espresso or a large latte that gets you going in the morning, the Cafe Roma can make it. Quickly, too! The Cafe Roma, because of its features and affordable price, could be the next best thing to keep you going at the office, especially after a rough morning or getting tired after a large lunch. This stainless steel design not only looks impressive, it just might impress anyone lucky enough to use it, especially on a daily basis. The features of the Cafe Roma are as attractive as its look, thanks to Breville and their attention to detail. With a dual-wall filter system and 15-bar thermoblock pump, the price may just be hard to believe, and that’s not all it has to offer. Breville loaded this machine with a lot, including a froth enhancer, cup-warming plate, removable dip tray, a system to disengage the heating element when the set temperature is reached, and even comes with a frothing jug to get the most out of whatever beverage you prefer. Another few features that the Cafe Roma includes is a water-level indicator, a removable water tank, and a useful steam wand, which will help froth milk exactly as needed for a variety of coffee beverages. Capresso is a company that hasn’t been around as long as other companies on our list, only since 1994 in fact, but that doesn’t mean their machines can’t make a mean cup of joe. Or Espresso. Or even lattes. Essentially, although they may be relatively new to the game, they’ve done in 25 years what other coffee machine manufacturers have done in a much longer time-span. The Ultima Pro has many features, of which include a 15 bar pressure system to get that espresso to the highest quality and consistency, about on par with the drinks from your local cafe, no matter how great your barista is. Because of this system, frothing too can be optimized for that perfectly thin, or thick, layer of foam. However you like it, Capresso seems to be able to satisfy a lot of espresso lovers. Capresso doesn’t stop at pressure when it comes to the design of the Ultima Pro but boasts many other elements to help make the best coffee drinks imaginable. The self-tamping portafilter, for example, is for truly getting that perfect tamping. The removable water tank, which can hold 32 ounces, is completely removable to make filling fast and simple. De’longhi, an Italian manufacturer that brought their products to the American market in 1985, knows how to make excellent machines that can brew a large variety of coffee beverages, most important of which for this list is espresso. The 15 bar pump, an affordable line by De’longhi, may be the next best thing to grace the office, thanks to all of its unique design features. First of all, the Bar Pump comes with two thermostats, allowing water and steam temperature to be controlled separately. This makes the process a lot easier, not to mention faster. The 15 bar pump pressure only adds another element for tricky espresso, ensuring the ease of making the best drink possible. The boiler is made of high-quality stainless steel, making it durable and long-lasting, a perfect reason it would fit nicely in an office setting. Another reason is because of how simple it is to use, made possible by the patented dual function filter holder, allowing both pods or ground coffee to be utilized. Most people know the Ninja brand, made popular by their late-night infomercials mostly surrounding their blenders, but they’ve made themselves a household name for much more than just their blenders. This is impressive, considering the company is only 20 years old, and they have successfully breached into the market of coffee and espresso makers. This espresso machine packs a lot, so much so that it might be the most advanced system on our list. 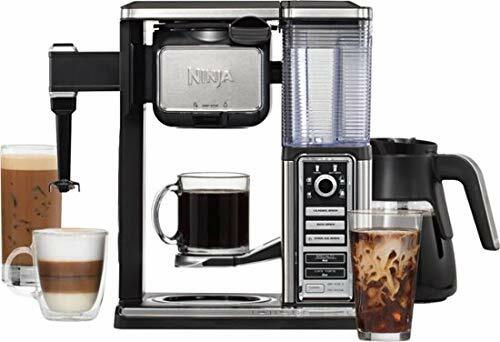 The Ninja Coffee Bar, from its different drink modes to all of its convenient design features, has the potential to please and satisfy even the pickiest of coffee drinkers, even espresso lovers. The first unique feature that might draw your eye is the variety of drink sizes. Coming in six different options, ranging from a small cup to a full carafe, this machine will most likely satisfy any quantity need. Next, the brew, and even more options on the way to the perfect cup of espresso. Some of the brew modes are Rich, Classic, Cafe Forte, and even an icy option for colder beverages. The Ninja Coffee Bar comes complete with a glass carafe, making it easy to determine the perfect amount of water to make enough espresso for everyone in the office. It probably goes without saying but this machine also comes equipped with a built-in frother and its whisk is completely removable and dishwasher-safe. Breville makes our list a second time and that is no accident. Their products simply speak for themselves. From their consumer-friendly prices to world-renowned quality, Breville likes to produce quality machines that work not only flawlessly, but effortlessly. Their Barista line of coffee and espresso makers is no different. To really up the ante, and the budget, of the perfect office espresso machine, the Breville Barista may be costly, but it makes up for its high price with bells and whistles that can deliver some really fresh and delicious espresso. 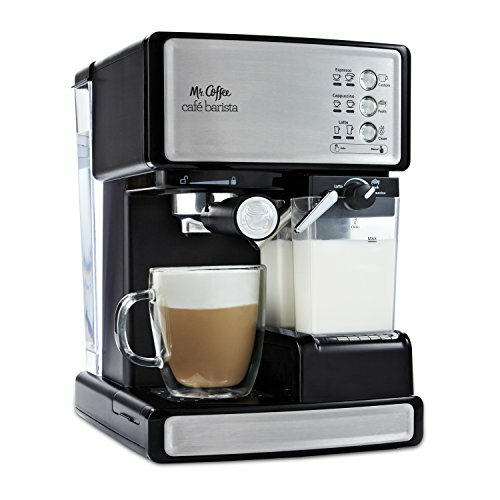 The Barista is full of useful features and designs to make this machine both user-friendly and easy to learn. Some of the features include a 1600W Thermo coil heating system for fast heating, a stainless steel burr grinder for easy blending of beans, and a 67oz removable water tank complete with a handle. A key component that makes the Breville Barista stand out is its Purge Function which acts as a guarantee for the perfect temperature of water. This works by automatically regulating water temperature after steam for the most efficient temperature at extracting that beloved espresso. Maybe even more impressive than its Purge Function is the Breville’s claim to make espresso from coffee to bean in under a minute. Their interchangeable filters and manual vs automatic settings help obtain this fast brewing time, all while keeping water and steam pressure at the perfect setting. The word barista gets a lot of people thinking of high quality, of the most delicious and delicately served beverages, and that’s because a true barista is expected to do exactly that. Maybe that’s why this is the second machine on our list that borrows its name from the skilled “coffee masters.” Mr. Coffee, for the second time on our list, comes up with any winning espresso maker. Their Cafe Barista model will impress you and your co-workers, and it’s not just because it’s easy to use. This machine isn’t the cheapest on our list but it’s not too pricey either, especially when you learn about its design and features. The Cafe Barista is capable of making a lot of different types of drinks, not just espresso, like lattes and even cappuccinos for ultimate variety. Like most of the machines on our list, Mr. Coffee put in a 15 bar pump system to help enrich some deep flavor into that java. On top of this, the frother on this design is completely automatic, making that foam just the way you like it. To choose different beverages, simply look to the one-touch display panel for full control over the selection you want. The water tank, as well as the milk reservoir, are fully removable to make clean-up fast and easy. After all, the best espresso comes to those who clean and take care of their machines.